I've been thinking about the ideal location for my own personal evil geologist lair (in case I develop any evil tendencies in the near or far future), and realized, with great sadness, that now that Mt. Shasta has already been taken by Garry Hayes, and because the best beach is already occupied by Jessica Ball, that I'd have to look somewhere else besides volcanoes. 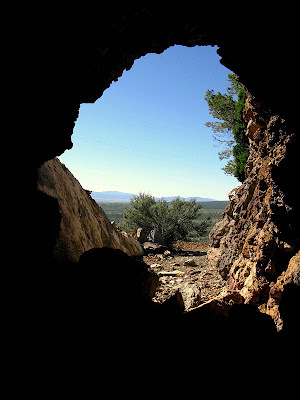 A good underground mine will be in a location not known to anyone else, so I can get away when needed and not be found when being searched out by whomever might be doing the searching (black helicopters have been suggested). It will therefore not only be in an obscure location, but its opening — a typical adit into some hillside either somewhere in Nevada, the Mojave Desert of California, or Idaho (don't ask me why the latter) — while looking like any other adit if you happen to be passing by on the surface, will be absolutely hidden from view from overhead. In fact, it will have multiple openings, as all underground mines should. The main adit opening will look rather uninviting to casual passersby, including most geologists, and would only possibly be entered by the most dedicated of exploration geologists seeking out gold or quartz or hidden structures. A second opening, way back into the hillside, will provide good ventilation (an air shaft), and will probably be so hidden on the hillside above that not even a scurrying-by pocket monkey or prairie dog will see it. 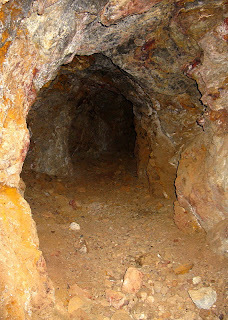 A third opening will be down a side tunnel, through an open stope that shows indications of incipient caving toward the left, so that most people in the know (underground miners, desert rats, exploration geos) will either avoid the room entirely or will at least skirt it far to the right, where booby traps can be set and sprung if needed. This open stope, once negotiated correctly, will lead into some drifts in solid quartz. Multiple levels will open up from this point, with elevators going up and down between levels, following the old, originally hand dug and now widened, raises. A back exit, only obvious with some digging around and following of anomalous air flows, will allow escape through an active underground mine on the other side of the mountain, where I will be able to exit surreptitiously with all the other miners at shift change. 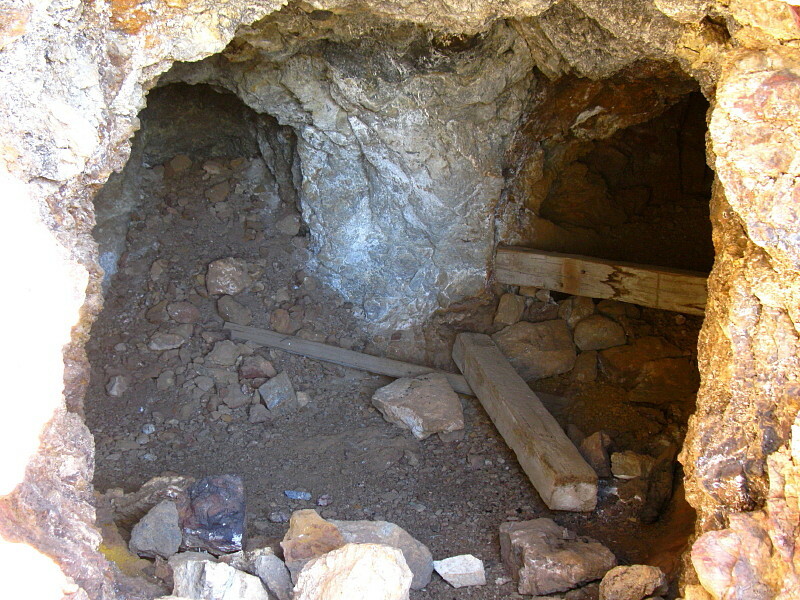 A fourth opening, the entrance of which will be partially caved so as to look uninviting, will lead past a caved open stope to a hallway of gold-bearing quartz that will impede the approach of even the most dedicated gold-seekers (they will have to stop for samples and won't pass further without taking their sample bags out to a typical mineral exploration pickup, thereby allowing time for any evil denizens of the deep who happen to be present to escape deeper into the mine). 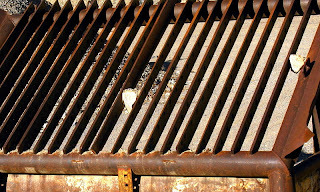 Beyond the wall of gold-bearing quartz, a flat-lying metal grizzly made of old mine rail will bar access to the last escape route. If anyone makes it this far into the deeps of the lair, they will not know to press a button inside a panel hidden behind the pile of slabbed, broken waste rock sitting nearby. In fact, they will ignore the waste rock entirely and go for the ore sitting next to the grizzly, large chunks of gold-quartz ore that the old-timers left because it didn't fit through the grizzly. Meanwhile, the denizen of the lair (that would be me), will be running down the haulage tunnel below the grizzly, heading for its opening in the wash right above the old, hand-built road, an opening now obscured by decades of flash flooding down a steepening canyon. The ATV awaiting me at this exit, will allow me to pass nearly unseen and certainly camouflaged by ordinariness, down the mountain to The Alternative bar, where I will blend in with miners and geologists alike. One view from a good lair. Labels: evil lairs, geologists, m.r., meme, mining, nevada, s.p., u.g. Sounds like a plan. I will bring the beer and beef jerky. Outfitting the lair will be the best part, and of course beer will be needed! I'd also like to have a heated pool (heat from B&R faults feeding the nearby basalt field can be tapped). we have one already but of course I can't reveal more than a few details ... Archean, metamorphic, massive overhangs and huge potholes for collecting rain water. Soon to be installed ... solar panels. Unfortunately it is 2 hours from the nearest bar any way you travel. Would love to hear more about your lair, Hollis, if you can blog about it without giving the location away. Too bad about the bar, you'll have to stock up! So many things I didn't add. Water - nearby springs. Solar panels, great idea and plenty of sun. Nearby volcano, yes; could be a great way to get out of the area unseen, with a huge amount of tunnel building. Or maybe I'll just extend one of the old mining trams. That sounds like a great set-up - especially with trams. I like your get-away-plan - that bar looks awesome! 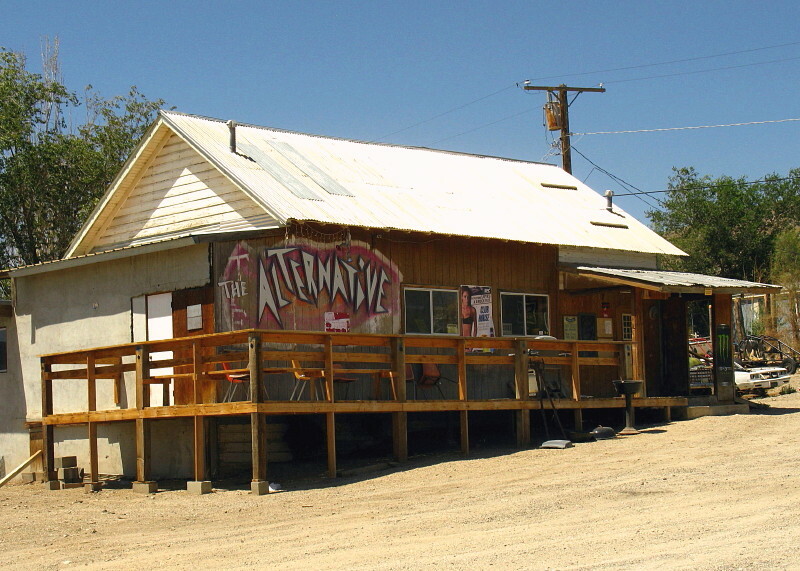 When I used to hang out in those parts, that was the "other" bar, the one you couldn't get 86ed from. So all the rowdy folks hung out there - and fights over pool tables were likely to break out once a week or so. Don't know what it's like now. It's the only one in town that's open anymore. This is just the kind of weird I can get behind. Good plan. I LOVE this! When I was "doing" biochemistry, we often discussed the mad scientist thing. I love that geologists do the same thing! Also, you geologists have us biochemists beat - we don't have cool lairs! I do, however, know a few that set up a lab to conduct experiments in their basement! A basement is fine unless the experiment blows up (maybe not so likely w/ biogeochem?) - so tunneling or having a basement adjacent to a cave or lava tube is highly recommened by your local geologists!